After opening their Confederations Cup campaign with a defeat to World champions Germany, the Australian football public were noticeably divided on the course set by Postecoglou and the Socceroos. Undoubtedly, Thursday’s match against African champions Cameroon would gain greater significance given both sides had lost their #ConfedCup openers. Martin Lowe gives us his takeaways from yesterday’s events in St. Petersburg, after another mixed Australian performance. It might have taken 45 minutes, but sure enough Australia again conceded a first half goal, and once more it came via a predictable avenue. Similar to Germany’s second effort on Monday, a lofted ball from the right hand side, over the defensive line caught the Socceroos static, and in went the opposing player, Andre-Frank Zambo Anguiss a runner from deep to loop the ball past the on rushing Mat Ryan. The pressure on the initial ball wasn’t there, but the main issue came from a lack of communication in the back line, a unit playing individually to firefight the situation. Trent Sainsbury pushed up to pull the offside trap, while Milos Degenek retreated, joined by an enthusiastic Maty Ryan, who was as good as his word pre-match, out to combat the defensive issues (albeit personally rather than collectively), but the passage was misjudged and Australia headed into the break 1-0 down with the last kick of the half. Much of the talk over the last few days has surrounded the formation, the exhaustively debated 3421. While the system showed its flaws against Cameroon, it was the personnel within that system that exasperated them. We’re now 6 games into Postecoglou’s rejig, and not once have we seen a successful 90 minute display from the defence; aside from the home UAE performance where Australia were rarely put under pressure, it’s generally been car crash stuff, but again it’s from individual inabilities rather than the system. Miloš Degenek was on a tightrope ahead of this match after a nervy performance against Germany, so another abject display has almost certainly sealed his fate. He was joined this time by Bailey Wright, who too often in the first half positioned himself squarely with Cameroon winger Christian Bassogog, only to be left with twisted blood and in danger of conceding a penalty kick on a number of occasions. 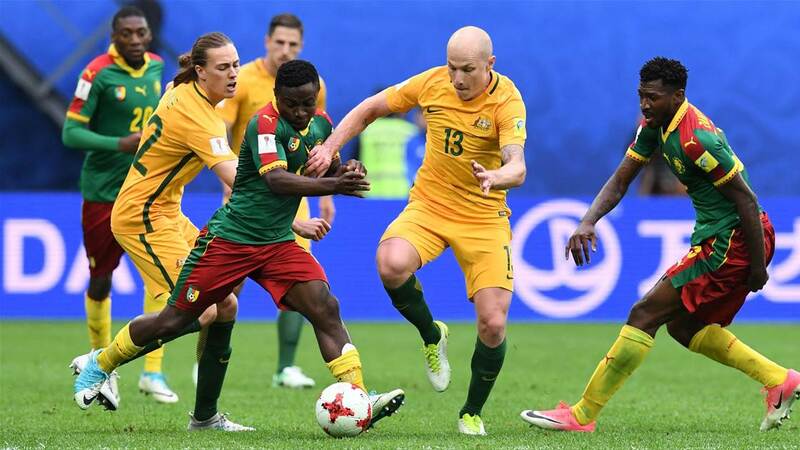 The second half was little better for the defence, as Vincent Aboubakar spurned a number of opportunities that the Socceroos can’t expect to withstand against Chile at the weekend. If only there were alternatives to partner Trent Sainsbury (the best of a bad bunch generally), yet Postecoglou can only look to Ryan McGowan, another who’s already shown his unsuitability in this system, and his brother Dylan, who is an unknown quantity at this level. At this point, however, there’s little to lose, now that we know Australia need an unlikely three points against Chile to progress to the semis. I’d prefer Mark Milliagn dropped back, yet this pulls up further more issues of personnel going forward. There’s a good chance the Socceroos will progress to the World Cup next year, one way or another, without nailing down a comfortable three man backline. The question that needs to be put to Postecoglou, is while we wait for a player (or ideally two) to take their opportunity to become a real success in the role, can he afford to continue on with this system, or can they flex to a plan B of sorts? Rogic remains the class act, but does the system allow for a plan B? It wasn’t just in a defensive manner, where Australia lacked something different, and while the system clearly sees a marked improvement in attacking areas, when we narrow down to the last quarter of an hour, flexibility looks in short supply. Having to carry Tom Rogic and Robbie Kruse, two men lacking full match fitness from the start, already concedes changes are needed in the second period, but for a team that relies so heavily now on Rogic’s ability to initiate a switch between midfield and attack, this system lacks effectiveness if his presence isn’t felt. I’ve been perplexed by Jackson Irvine’s sudden withdrawal from the starting lineup; Australia’s best player in March, given Mooy has now been withdrawn to a deeper role, and with fitness concerns over Rogic and Kruse, you’d assume he was in for a greater portion of action. Twelve minutes from the end in St. Petersburg, he was given his tournament debut, a couple of openings but not enough to turn the game. His introduction came after Tim Cahill’s roll out, ill-judged in hindsight, given he couldn’t connect in the box in open play, but it was the perfect time to switch it up. Alex Gerbash down the left had already put over some inviting crosses for Tomi Juric, so to push on the young wing back, or to shift to a 4231-esque formation to keep their wide men up the field would have played into the hands of the physical dangers Irvine and Cahill provide. Throwing on Troisi, Irvine and Cahill left the Socceroos motionless, with the weary Leckie and Gersbach lately pinned back by Cameroon who finished the stronger. It begs the question: why bring these players on, who are much better in the final third in short impacts than in build-up play, if you don’t change the system to suit them? Is Mat Leckie’s security in the side coming to an end? Over Postecoglou’s tenure, he’s stuck by only a few key players, throughout the evolution towards the end product we see today. Even then few are exclusives; Mile Jedinak and Mark Milligan, have at times shared pitch time and even the once undroppable Maty Ryan made way in March against Iraq. This leaves one man in Mathew Leckie, who’s stranglehold on the first team has never been in doubt, despite being shifted around a number of positions. Whether it be in his more favoured position, wide right of attack, or in partner of the centre forward in the 442 diamond days, to now where he’s been shifted to a much more defensive starting point as right wing back, Postecoglou clearly sees Leckie as one of, if not the most indispensable players on the team sheet, very rarely making way either despite high intensity performances and the fact Australia have a host of attacking players sitting on the bench. Leckie’s limitations previously surrounded goal-scoring, something he put to bed in March, scoring two untypical headed goals against Iraq and UAE, but since his move to wing back his defensive capabilities have now been put under the microscope, ever more so since the start of the Confederations Cup. While he’s never been thought of in such a capacity previously, the work rate to fly up and down the flank which has always been his key selling point, has ensured he hasn’t had a horror show thus far, but he can look out of his comfort zone at times. Starting at such a deep position has only negated Leckie’s attacking threat, not necessarily at home against similarly ranked or weaker sides, where he’s offered greater freedom, but against stronger sides where Australia have found it difficult to deal with their opponents attacks quickly. Defensively it often looks like he’s throwing too much at the cause, more often than not diving in too early or giving away soft free kicks, and from an attacking sense, as was the case in the first two matches, he’s far too deep to use his unquestionable pace. While other areas in the side have few options to play with in terms of replacements, Ange can hardly moan that he hasn’t got the perfect options for right wing back in two domestic gems; Rhyan Grant and Josh Risdon. Postecoglou has remained firm that he promotes form over reputation, but to overlook both of these seems to prove he has an issue with selecting A-League players. Strangely, the only domestic defender called up was uncapped Dylan McGowan, who hardly had a barnstorming campaign with Adelaide United last year, but is moving to Europe this summer. Is his ambition being rewarded rather than his form? Grant in particular couldn’t have done more, a forward thinking full back who excelled in a record-breaking Sydney side last term, he’d have at the very least fitted the philosophy of Postecoglou, something that is replicated on the other flank, where Alex Gersbarch performed more than adequately against Cameroon. Grant was called up for the March set of internationals, but didn’t feature, insinuating that the call-up alone may have been reward enough until the young full back breaks away from Australian domestic football. Deploying a player more suited to defensive situations, but still capable of threatening higher up the pitch would allow Leckie to become a selection possibility in other areas; an alternative to Robbie Kruse who looks much better as one of the central attacking midfielders opposed to the wing back role he occupied against Iraq. But to forcibly select Leckie come what may in a position that fails to get the best out of the Bundesliga based winger seems an odd one. Either return to a system that best utilises him as an out and out wide man, or look for better alternatives.